An epic adventure into two of the best big cat safari destinations in Africa. We’d been sitting with her for some time, time enough for the stoic patience, discipline and focus, the requisites of wildlife photography, to have long since been replaced by cold drinks and warm snacks. “She’ll never go for them” I said, “she wouldn’t even consider taking them on alone” I reaffirmed, doubling down on my position. It was a wiser man than me who said never say never in the bush and, as she began silently stalking in the low light of dusk, I sunk lower in my seat. In my own defence it’s not the standard operating procedure of most lionesses to hunt large herds of buffalo alone. All the same she crept forward, undermining my credibility with every step, narrowing the gap between them. The sun had set just minutes before and was the first truly iconic African sunset of the safari with a tall grove of cathedral mopane trees silhouetted against the bleeding Zambian sky. We were only 2 days in and already had photographed wild dogs hunting, a leopard hunting, said leopard and her tiny cub interacting, elephants crossing the Luangwa River and now, a totally unpredictable lioness hunting a herd of buffalo at least 200 strong. With 8 days of safari still to come I was concerned we were using up all our luck at once. I needn’t have worried. "The experience on offer in this magical place is one of true wilderness, of untouched beauty and simple solitude..."
African rivers are primal things. The ancient sculptors of the landscape, they resonate with life, the beating heart of the continent. Where they flow life will follow and it is for this reason that most of Africa’s great wildernesses have at their core a mighty river. My most recent Oryx photo safari was centred on two of these great rivers, the Luangwa and the Sand. At the Southern tip of the Great Rift Valley the Luangwa River carves it’s way through what, in the dry season, is an otherwise arid landscape. The deeper pools are home to the highest density of hippos on the continent and the crocodile population is equally impressive. Overlooking this conglomeration of life and adjoining the Nsefu Sector of the South Luangwa National Park is Tafika, our base for the first 5 nights of the safari. The experience on offer in this magical place is one of true wilderness, of untouched beauty and simple solitude, rare in many of Africa’s more well known safari destinations. The focus is not on the pursuit of one sighting followed immediately by the next, but rather on total immersion in the environment and an embrace of all it has to give. Don’t get me wrong, the game viewing is exceptional; vast herds of buffalo and elephant are drawn to the river daily and sprawling herds of puku line its banks. 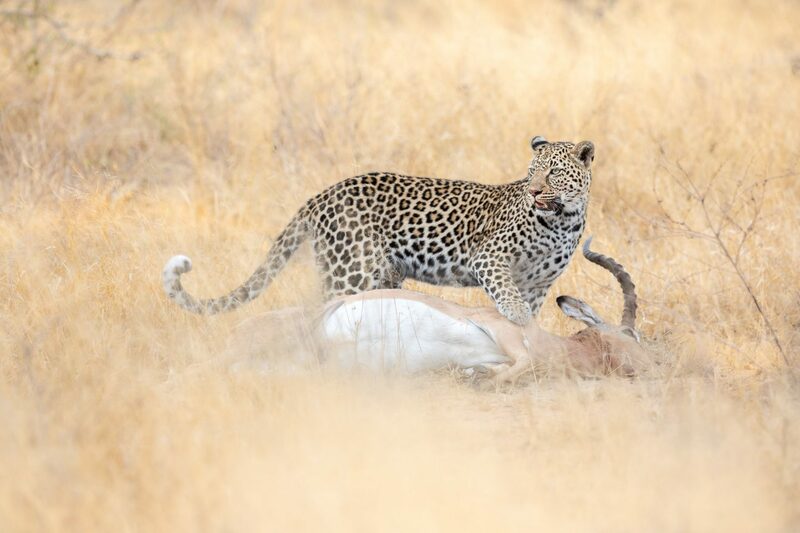 The latter, in combination with impala, bushbuck and a host of other small mammals, lead to excellent and regular sightings of lions, leopards and wild dogs. In case you’re wondering what transpired with the ambitious yet disingenuous buffalo-hunting lioness; she was not successful. I can’t be entirely sure of what went down because, like I said, the light was failing and as she ran in on the herd they turned tail as a single mass and charged into the dense mopane grove. 5 minutes passed and there was no further sign or sound until our spotlight fell upon two glowing eyes and a dejectedly traipsing lioness skulking away in the opposite direction to that in which the buffalo had fled. After 5 nights and 10 game drives it was time to leave the languid flow of the Luangwa River with its soundtrack of hippos behind us and head South to arguably the leopard and lion capital of Africa, Malamala. With Malamala on an itinerary you know that you pretty much have a sure thing in terms of predator sightings. Running through the length of the reserve is the Sand River and at this time of year it’s the only water source in the area. As a result it attracts large numbers of pretty much everything which means plenty of food to go around for the big cats. A high prey density allows for smaller territory sizes because not as much real estate is needed to survive. Smaller territories allow for higher predator densities and therein lies the magic of Malamala. I’d explained this on the flight in but let’s face it, they’re just words until they’ve materialised into paws, claws and amber eyes. An hour after pulling into camp, the marvellous Rattrays on Malamala, I was filling my frame with the high tea spread when a commotion on deck pulled my attention away from a coconut covered date ball that I’d had my eye on. There was a lioness in the river bed directly below us, then another, and another. The trio were heading North, with purpose. The date ball would have to wait, Malamala was about to deliver. Photographing lions that are going somewhere in a hurry is tough, just keeping up with them is a challenge in itself so hats off to our guide, Andrew, who managed to predict their movements and position the vehicle for a few shots to be taken where possible (my lips were sealed in this regard since the lion/buffalo thing in Zambia). In contrast to the focus on wilderness and oneness at Tafika, at Malamala your energy is channeled towards maximising on the bountiful photographic opportunities that present themselves and in our case this pertained almost exclusively to predators, so much so that we spent over 10 hours with leopards alone. Two of those hours were spent with a female and her 3 cubs, yes, 3 cubs. It’s highly unusual for a leopard to raise more than 2 as the energy required to support them is immense. These 3 were still young but to have made it as far as they have is a true testament to their mother who, it so happens, has only one eye! Another leopard that we were privileged to spend time with was a young female who was orphaned at little over a year old. At this age a young leopard is not necessarily always in its mother’s presence but is still very dependent upon her for food and protection. It’s now a year later and, against all odds, the Three Rivers Female as she is now called, is alive and well. She truly is a legend in the making. I may have harped on about the predators of Malamala to the detriment of painting a holistic picture of our time there. There was an absolute abundance of life in almost all its forms; from large herds of elephants sprawled across the river bed to buffalo, giraffe and the full array of the antelope species that call the area home. As is always the case on photo safaris by the time 10 days had passed I wondered both where the time had gone and how we had managed to fit in as much as we did. The days are so full that they fly by while at the same time dishing out a disproportionate amount of memorable experiences so that by the time the safari has come to an end it feels like far more time has passed than actually has. For now I have more images to sift through than you can shake a stick at so, on that note, I better get to it.